President Donald Trump on Friday said he is planning changes to H1-B visas, which are issued temporarily to highly educated immigrants so they can work in specialty occupations, that would create simplicity, certainty and a possibility that the workers could become U.S. citizens. "H1-B holders in the United States can rest assured that changes are soon coming which will bring both simplicity and certainty to your stay, including a potential path to citizenship. We want to encourage talented and highly skilled people to pursue career options in the U.S.," Trump said in an early morning tweet. Russia on Friday demanded an explanation from the United States about charges brought against a Russian lawyer who attended a June 2016 meeting at Trump Tower who was this week charged in a separate case.Natalia Veselnitskaya, who represented Russian defendants in a money laundering case settled in 2017, has been charged with obstructing justice in that case for submitting a declaration that she falsely represented came from the Russian government independently, U.S. prosecutors said on Tuesday.Speaking at a weekly news conference, Russian Foreign Ministry spokeswoman Maria Zakharova said it had become a habit in the United States to open criminal against Russians based on vague claims. 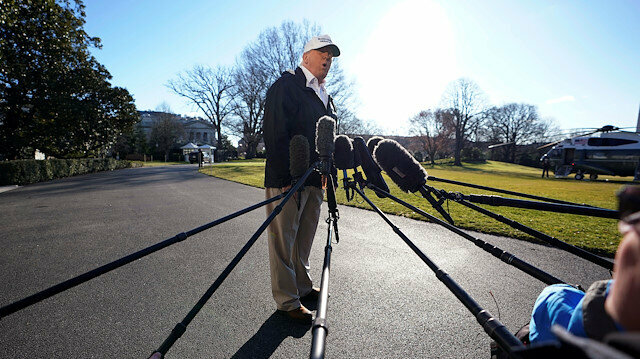 President Donald Trump, facing the prospect within days of the longest U.S. government shutdown in history, was considering declaring a national emergency that would likely escalate a policy dispute with Democrats over his proposed U.S.-Mexico border wall into a court test of presidential power.To escape a political trap of his own making, Trump suggested strongly on Thursday that he might declare an emergency so that he can bypass Congress to get funding for his wall, which was a central promise of his 2016 election campaign.He originally pledged Mexico would pay for the wall, which he says is needed to stem the flow of illegal immigrants and drugs. But the Mexican government has refused. Trump is now demanding that Congress provide $5.7 billion in U.S. taxpayer funding for the wall.That is opposed by Democrats in Congress, who call the wall an ineffective, outdated answer to a complex problem. The standoff has left a quarter of the federal government closed down and hundreds of thousands of federal employees staying home on furlough or working for no pay and set to miss their paychecks.The partial federal government shutdown entered its 21st day on Friday. It will become the longest shutdown ever on Saturday.With no Capitol Hill compromise in sight, Trump publicly ruminated on Thursday during a trip to the Texas border about declaring an emergency.A close Trump confidant judged the time for such a step had come. Republican Senator Lindsey Graham said in a statement: "It is time for President Trump to use emergency powers to fund the construction of a border wall/barrier. I hope it works. "The Wall Street Journal, NBC and the Washington Post, citing unnamed sources, reported that the White House had asked the U.S. Army Corps of Engineers to look into diverting money from its budget toward the wall and to explore how fast construction could begin under an emergency declaration. Reuters could not immediately verify the accuracy of the reports.US aims to establish Middle East Strategic Alliance: PompeoBOXED INCritics of the national emergency strategy have said it may be illegal. In any case, it was almost certain to trigger an immediate court challenge from Democrats, including an accusation of trying to circumvent Congress' power over the national purse strings.That would push the wall impasse into the courts, allowing the government to be fully reopened while the judges weigh the case, which could take months. "After the emergency announcement, the path toward construction via executive order may be as unclear as a storm at midnight. But it will at least allow the president to move out of the corner he’s boxed himself into," said Charles Gabriel, analyst at strategy firm Capital Alpha Partners.Partial government funding expired on Dec. 22, leaving departments ranging from Justice, Agriculture and Treasury to Commerce and Homeland Security without money to operate programs and pay their workers.An emergency declaration would come with risks. Even some of Trump's fellow Republicans in Congress have signaled worries about such an action. Given that the Constitution gives Congress the power to set spending priorities and appropriate money, they worry about a tough legal fight and an unwise precedent. 'CROSSING THE RUBICON'"If Trump crosses this Rubicon, what would prevent a Democratic president from declaring a 'national emergency' on Day 1 of their administration on climate change and/or healthcare?" Chris Krueger, an analyst at strategy firm Cowen Washington Research Group, asked in a commentary note.Senator Joe Manchin, a moderate Democrat who has had good relations with Trump, said declaring a national emergency would be "wrong, but I think that's his only way out. "Manchin predicted that if Trump made the declaration, Congress would immediately move to pass bills funding the various agencies, knowing that the president would then be able to sign them into law.While some Republican senators have begun clamoring for an end to the shutdown, party leaders toeing Trump's line this week have ignored passage in the Democratic-controlled House of Representatives of funding bills for government agencies. The House was expected to pass more such bills on Friday.